This 4 bedroom 2 bath duplex beach home is located just a couple blocks from the sugar white beaches in the heart of Gulf Shores, Alabama. This home will comfortably sleep up to 12 guests as it includes 2 queen sleeper sofas in the living rooms. The spacious living rooms are also equipped with flat screen TVs so you can enjoy having cozy movie nights in. The Gulf's Secret Four is just a short walk to the beach where you can enjoy a fun day in the sun! You are within walking distance to many great restaurants and shops including the famous Hangout. Nearby attractions include the zoo, mini-golf, water park, go-karts, charters for fishing and dolphin watching and more! Don't forget to bring your dog(s) along in this pet friendly unit. 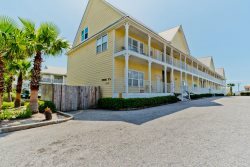 If you're looking for a great beach vacation getaway on a budget, this affordable home is for you! NOTE: The Gulf's Secret Four is the entire home. You can also rent just one side of the duplex, either The Gulf's Secret North (2 BR 1 BA) or The Gulf's Secret South (2 BR 1 BA).